When your kids are looking for a snack-activity before the big feast, let them get creative by assembling a turkey crudite. Make the spinach dip a day in advance to limit the kitchen activity on Turkey Day. 1. Place the thawed spinach in a colander. Squeeze out the excess liquid. Then place it into a mixing bowl or a food processor. 2. Mix the spinach, sour cream, cream cheese, Parmesan, garlic, 1/2 teaspoon salt, and 1/4 teaspoon pepper together in the bowl (or in a food processor) until smooth. 3. 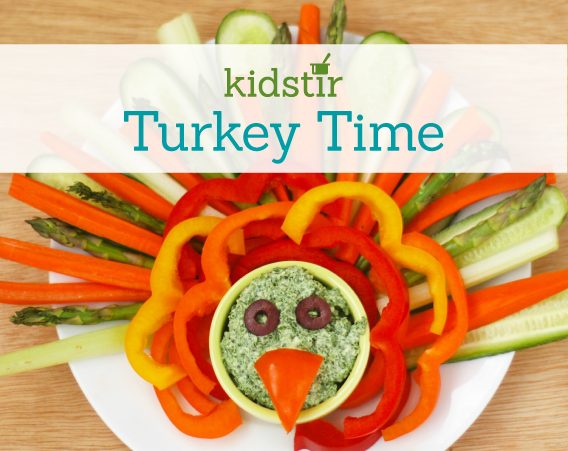 Cut and arrange the veggie dippers in a turkey shape. Add a bowl of the spinach dip to the plate for the turkey face. Then add a pepper beak and olive eyes.